Will Al Iaquinta shock the world and become a hometown hero at UFC 223? UFC 223: Khabib vs. Iaquinta will take place on the 7th April at the Barclays Center in Brooklyn, New York. This event has had some last minute changes, but it still looks set to be an amazing event. In the main event, Khabib “The Eagle” Nurmagomedov will take on late replacement Al Iaquinta for the UFC lightweight title. Al Iaquinta weighed in at 155.2 before he knew that he would be taking on Khabib Nurmagomedov meaning that he is unable to win the title, but this is still a massively important fight for Iaquinta. He has the opportunity to shock the world and UFC President Dana White has claimed that Iaquinta would still be the champion if he was to win regardless of New York State Athletic Commission rules, stating that they would find a way around any potential issues. Khabib Nurmagomedov has had a rollercoaster week. He has been matched up with 5 different opponents in the build-up to UFC 223, but he believes that this is his time to show the world just how great he is. In the co-main event, the UFC women’s strawweight champion Rose Namajunas takes on Joanna Jedrzejczyk. Jedrzejczyk has her eyes set on revenge after losing her championship in their first meeting, but Namajunas will look to repeat her shocking victory at UFC 217. 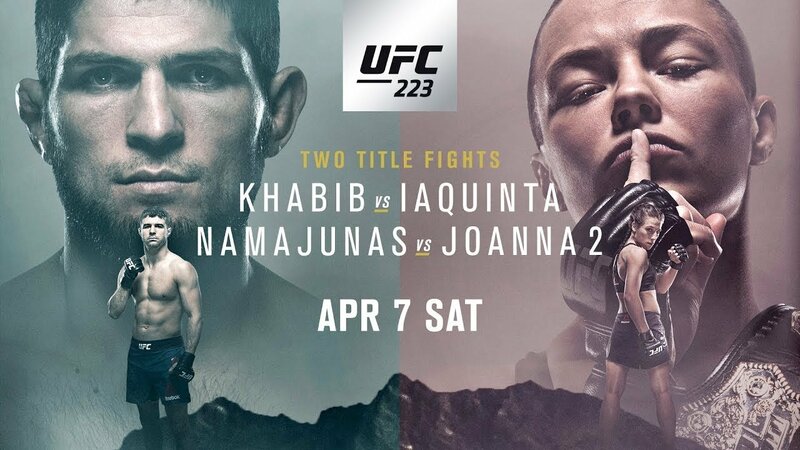 For live results of UFC 223: Khabib vs. Iaquinta stay tuned to this article. Check out UFC 223 results below.